Read my review of Michele Hauf's new paranormal romance The Highwayman. I have an autographed copy of the book up for grabs to a luck commenter. Open until July 10. Author Laura Resnick will be here Wednesday July 8 to talk about her new fantasy book The Purifying Fire as well as update us on her urban fantasy projects. Five copies are available of The Purifying Fire. Contest details here. Open until July 10. The Felix Castor Contest with author Mike Carey has started with 5 copies of his soon to be released Dead Men's Boots up for a grabs as well as 3 Grand Prizes of the first three books in the series. Contest details here. Open until July 23. I have a terrific interview with Mike Carey scheduled for July 16. Come join us. Literary Escapism has the Escapist Newsletter (Vol 3 Issue 7) out with a terrifically comprehensive array of urban fantasy news. Diana Rowland’s first sale posting over at Dear Author. Kelley Armstrong is interviewed at Ian O’Neill’s blog. Yasmine Galenorn’s Bone Magic Book Trailer. Read an interview with Juno Books editor Paula Guran. Recently acquired by Pocket Books, Juno specializes in urban fantasy. Suvudu Free Library has added Darkfever written by Karen Marie Moning available as a free download. Babbling About Books interviews Paul Samuelson, who is a publicist for Sourcebooks. He was asked why hitting the NY Times Best Selling list is so important for an author and their publisher and if book reviews on blogs really do matter... Very insightful. Check it out. A terrific post on The Joy of YA Author Blogs over at Persnickety Snark. For those that may have been eying the George Mann fantasy books in my July Releases list, Fantasy Book Critic has this review of The Osiris Ritual and an interview with George Mann talking about the future of this steampunk series. Vicki Petterrson interviewed on Las Vegas Weekly. Ilona Andrews has a snippet from her upcoming novel On the Edge posted here. Debut urban fantasy writer Kristen Painter reveals that her agent, Elaine Spencer, sold her book Blood Rights to Orbit in a three book deal. Suzanne McLeod continues her contest countdown for the release of her book The Cold Kiss of Death with a giveaway to win your choice out of the five Felix Castor books including The Naming of The Beasts along with a signed copy of The Cold Kiss of Death or The Sweet Scent of Blood. The World in the Satin Bag blog has posted a nice list of contests and giveaways. Literary Escapism is having a giveaway for three books Branded by Fire by Nalini Singh (Psy-Changeling #6), Seduce the Darkness by Gena Showalter (Alien Huntress #6) and At Grave’s End by Jeaniene Frost (Night Huntress #3). The Twilight Saga: Eclipse is scheduled to begin production on Aug. 17 and film through Oct. 31 at Vancouver Film Studios in that Canadian city, Production Weekly tweeted; David Slade (30 Days of Night) will direct from a script by Melissa Rosenberg. Vampire Wire sinks its’ teeth into the newly announced remake of Let the Right One In. Oh, dear, I know this will not end well. The American remake of the Swedish vampire hit, "Let the Right One In," will be directed by the guy that did "Cloverfield." Did you see "Cloverfield"? No, no one did. He said, "It reminded me a lot of my childhood, with the metaphor that the hard times of your pre-adolescent, early adolescent moment, that painful experience is a horror." In other words, he's going to throw in a hawt neighbor girl, fart jokes, and references to "Star Wars." Why, why, why in the name that all that is holy do you take an already marvelous film and "remake" it for people who can't be bothered to read sub-titles? Also posted this week cover art for - Dawnbreaker by Jocelynn Drake, Voices of Dragons by Carrie Vaughn, My Soul To Lose by Rachel Vincent and Hallowed Circle by Linda Robertson. 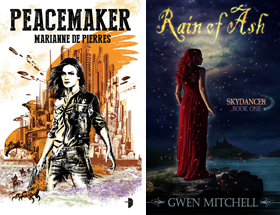 The Lurv a la Mode blog has discovered some great covers for upcoming fnatasy and urban fantasy titles and has some information about each. Here is a sampling of some of the urban fantasy titles. A stop-motion book trailer by Maggie Stiefvater for her upcoming novel, SHIVER (Scholastic, August 1, 2009), about a girl who loves a boy who must become a wolf each winter. The trailer was created with hundreds of paper cut-outs and multiple photographic frames per second. Music composed & performed by Maggie Stiefvater & Kate Hummel. Find out more at http://www.maggiestiefvater.com. Two ARCs of SHIVER, mailed out as soon as the contest is finished. Two finished copies of SHIVER, mailed out as soon as I get my author's copies. Two CDs of the music I wrote for SHIVER and LAMENT. 15 minute live-chat with the author (that would be me) to talk about my books, your books, your dog, or whatever! 1) Watch the trailer I made for SHIVER below (it took me dozens of hours to make the hundreds of paper cut outs and then photograph the multiple frames per second)(Yes I am crazy). 2) Post a link to the trailer or embed the trailer online. Every unique place you post it counts as an entry. Sooo that means you can embed it on your LJ, post a link on twitter, post a link on your Facebook, and embed it on Myspace, and it would count as 4 entries. 3) Comment back here telling me where you linked it, numbered like so: 1. LJ, 2. Twitter, 3. Facebook, 4. Blogger, etc., with linkies, so I can spend my time writing more books instead of counting and verifying entries. I will hold a Giant Drawing on Tuesday, July 7th, at 9 p.m., and post the winners here and on my Livejournal Blog. Doug, my laptop broke down and missed it here for a while, but so can depend on you to get me all up to date! Thanks a huge bunch! I'm off to almost everything you posted here with the links. 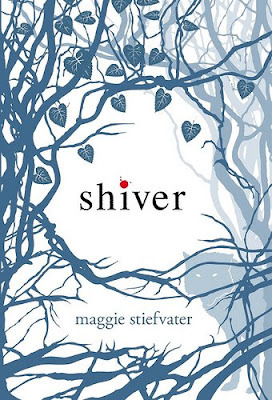 One question, the SHIVER book contest is not here on your blog, right? I wasn't sure with all the info you had up on this post. 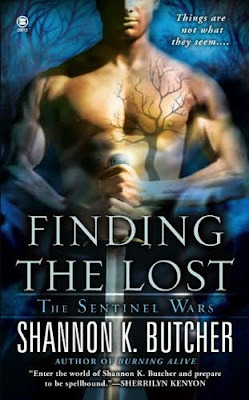 Gosh, I know its not to be relied on for whats in the book, but I love the great covers that keep coming out! Hi Caffey glad you are back up and running. Missed you. Sorry about the confusion on the contest. Yes it is on Maggie's blog here. So many contests, so little time! Pick me! Pick me! Great reviews! Lots of wonderful info. :) My daughter is over the moon about Johnny Depp as a vampire. :) I have to admit, I'm a little excited as well!! Looking forward to the interview with Mike Carey. He's been on my radar for a while, but I just haven't gotten around to checking out the Felix Castor series. Actually, the same with Maggie Stiefvater. The book trailer was beautiful! Lots of contests out there Sharon. You could spend a lot of time entering but then when would you have time to read? Michelle Depp is amazing in anything he does. Be interesting to see what he does with this classic. Thanks Renee! Yeah Mike only came onto my radar this year but I am hooked now. Maggie's trailer is VERY impressive. I kept thinking as I watched it that it had a NFB vibe to it (National Film Board) which has turned out boatloads of quality animation here in Canada over the years. Thanks again Doug for all the great information around the web! I know I can come here to catch up on anything I've missed. Kmont that is a superb book video and I would buy the book on that basis alone. Chills over Shiver? That's the point!